Here it is. Our best wedding photography tips for all those photographers who are eventually asked to photograph their friends or family wedding day. No doubt if you own a digital SLR camera the day will come when you are asked to photograph your first wedding. For amateur photographers this can be a daunting experience. However, wedding photography need not be as frightening as you think. So how do you go about photographing your first wedding? This is a question I’ve been asked many times through our Facebook page, so I thought it time to write it down so amateurs can learn from my personal experience with wedding photography. The first step is to make sure you have the right equipment. Obviously it’s going to be hard to photograph a wedding if you don’t have suitable camera gear. Wedding photography is easier with two camera bodies. If you don’t have two camera bodies, I recommend asking a friend or family member if you can borrow one for the day. 99% of the time when photographing the actual ceremony I use two main lenses. Having a camera body for each lens saves time changing them constantly mid service. Having two camera bodies is also more reliable! There is less stress on yourself as the photographer when you know you have a backup camera. You only get one shot to photograph a couples wedding day and you never know when your main camera will unexpectedly stop working. Owning a camera that allows you to insert two memory cards is an advantage. Just like camera bodies, memory cards also fail. Mid to high end cameras will allow you to save each image to both memory cards. This way you’ll always have a backup set of images. Purchase 2 X 64 GB memory cards minimum. The last thing you want is to change memory cards during the bride and grooms first kiss as a married couple, or during the important wedding dance. When it comes to lenses, you’ll need both a portrait lens and a general purpose zoom lens for the ceremony. Personally I use a Canon EF 85mm f/1.8 USM Lens (for bride and groom portraits) as well as a Canon EF 24-105mm f/4 L IS USM Lens (especially useful for group photos). Other professional wedding photographers prefer the more versatile Canon EF 70-200mm f/2.8L IS II USM. If you own a lens similar to the third I mentioned here (i.e goes from 70-200mm focal length and opens to aperture f/2.8) forget the initial two I listed, as you’ll already have the perfect setup. Instead add a wide angle lens to your list for those large group shots. For Nikon or other brands you may want to read – What is the best lens for portraits. Should I use a flash for wedding photography? Another question I’m asked often by amateurs. Personally I don’t use flash for weddings. Most people find flash going off in their face annoying. Flash also takes time to warm up and for weddings you want to be ready to capture that special moment in an instant. Occasionally I’ll take a few photos with flash to give the couple more variety when it comes to choosing the images they want printed. However I find flash is so 80’s fashion magazine style and not what couples generally speaking want for their weddings. Instead learn as much as you can about natural light photography. Also learn how to use reflectors to minimize panda eyes. Now you are comfortable knowing you have the right camera gear for wedding photography, the next step is preparation. Here is a list of the most important steps you should take when preparing to photograph a wedding. Organize a backup photographer that you would trust with your own wedding! I can’t stress this enough. You can never foresee illness for yourself or immediate family members who may need you on the wedding date. Sometimes things happen, plan for it ahead of time so the bride and groom aren’t left scrambling at the last minute for a wedding photographer. Ask the bride to send you examples of wedding photos that she likes. This will give you a good idea of the style she is most likely to want for her own wedding album. Become familiar with photo editing software such as Photoshop. There is no such thing as a bride who wants unedited wedding photos. It can be something as simple as black and white conversions, to removing old injury scars on a brides arm. Plan the time frame for the day well. For example, you can’t be in the bridal preparation room until the last minute and think you’ll be ready to capture beautiful photos of her arriving in the car at the same time. Also don’t forget the groom. You need to set aside sufficient time to photograph both the bride and groom. Be clear in your mind what you are going to photograph, at what time and for how long. Check the location out prior to the wedding day and take some test shots around the same time as the ceremony will take place. Talk to the person who is arranging the event and if possible ask that the bride and groom be positioned in favorable light during the ceremony. Usually the first part of your job as a wedding photographer is the bridal change room. Don’t go in and start shooting straight away. Instead I suggest spending the first fifteen minutes taking notice of any emotion or tension in the room. The last thing you want is to stress the bride out more if she is already highly strung (it does happen). During this time take notice of the people in the room. In my experience those who are in the bridal room are often the most important friends and relatives of the couple. You want to take plenty of photos of these people throughout the day. Apart from the usual rings and dress shots, also photograph everything the bride and groom has spent good money on. For example if the brides shoes or grooms cufflinks are a brand name, photograph the item with the brand logo showing. At times like this, people spend money on branding they wouldn’t necessarily buy otherwise. It is important to them so photograph it. I always ask that the bride not be dressed before I enter the room. Or rather not be done up. Capturing the hands of the person helping her do up the back of her beautiful dress are always great shots. It’s also when you get to photograph a lot of emotion between friends and family members. Use layers in your photographs. When photographing the bride in the room make sure you have two or three of her bridal party standing behind her just out of focus so your photos have depth to them. They always end up favorite images. Always get a couple of shots from different perspectives. For example go down to the street and capture her looking out of the room. Or photograph her reflection in a mirror for instance. Special moments to capture for the groom is that nervous waiting prior to the brides arrival. Or the camaraderie between him and his mates. 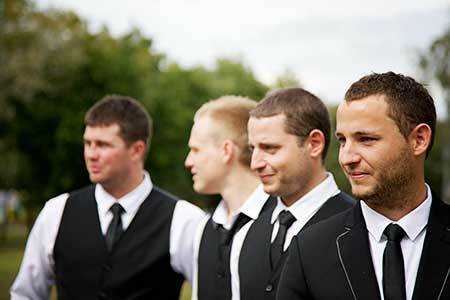 If you have a second shooter, ask them to capture his first look at the bride as she gets out of the car. One person to capture the bride, the other to capture the groom. They are always great memory keepsakes and help to tell the story. During the ceremony capture images from both the bride and grooms viewpoint. For example, the bride with her side of the wedding party, then the groom with his side. Zoom in, zoom out, close-up shots, long wide shots, mix it up as much as possible. You want to give the couple a variety of images to choose from. While you are busy photographing it’s of utmost importance that you have an ear open and listen closely to the celebrant. You need to know when the end is nearing and get into position for photographing the couples first kiss. In my experience, I find the person who gets the most emotion out of a bride and groom are those who are closest to them. I’ll often have a small chat with the best man and maid of honor and ask that they help me to capture the best possible moments by keeping the emotion going as long as possible. Those first fifteen minutes after the ceremony when friends and family are congratulating the married couple are precious. Make sure you photograph as many of those moments as possible. Sometimes you just need to go with the flow. I find nowadays most couples know exactly what types of photos they want and how they want to pose. Of course have plenty in mind yourself, but for the most part the couple will have their own ideas. Every wedding will have people who don’t want their photos taken or give the photographer a hard time. In these cases, I recommend telling people that the bride and groom (call them by name) want photos of all their friends and family so they can remember this special day. Let’s take a photo, not for me as the wedding photographer, but for them and their wedding album so they will have plenty of special memories. Usually that solves the problem. If not, move on to the next person and don’t worry about it. Everyone nowadays has a camera. 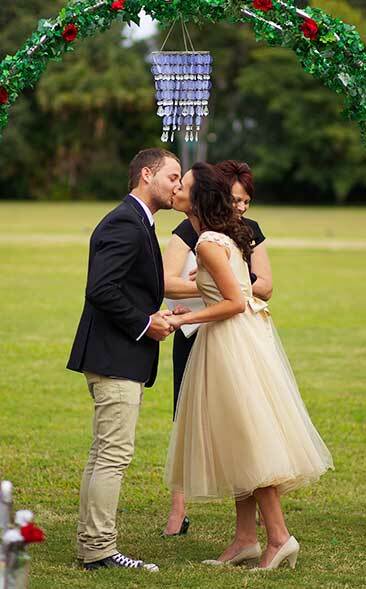 Whether it be an iPhone or a digital SLR, they will want their own shots of the happy couple. As the wedding photographer it is your job to capture the best photos. So how do you do this when there are a hundred cameras pointing at them from every direction. Personally I’ve never had trouble during the ceremony as people are usually sitting down or standing out the back. So I’m basing this advice on the after photos. The last thing you want to do is stress the couple out by being a grumpy photographer who tells great aunt or grandma to put their camera away. Everyone has a camera nowadays, so deal with it. One way is by thinking and moving quickly. Move a couple into position take several shots yourself before everyone realizes its done, then allow them to move in and take their photos. Move the couple again, quickly take several shots, then stand back and let everyone else take their photos. The normal photographer thinks slowly. While he or she is working out their camera settings you’ve already gotten the shot you need. 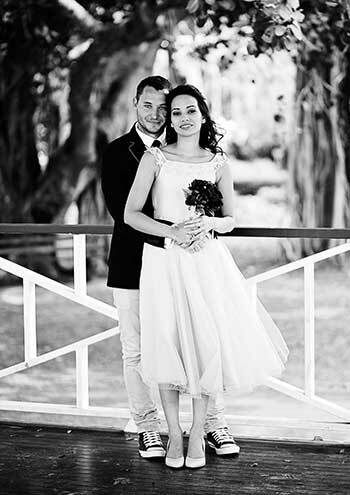 Another way that works quite well is to make a wedding photography tutorial session of it. You could tell friends and family that you want everyone to get great shots, so you’ll position the couple, test the lighting (i.e get your shots in first) then turn around and say to them, yep that lighting is perfect go for it. Then stand back and let them get a few photos. The bottom line is, you’ve already taken the photographs you need of that specific pose. After the first couple of poses, friends and family are happy to stand back and let you take the first photos because they understand by now that they are also going to get their chance. How should a wedding photographer dress? 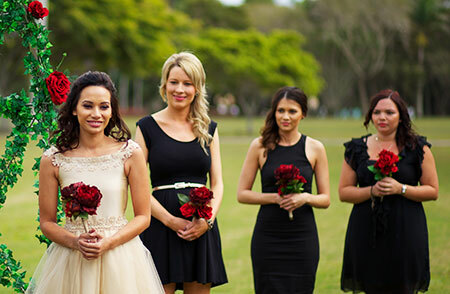 How should a wedding photographer dress is another big question asked regularly. Personally I think there should be no doubt that you are the wedding photographer. I recommend dressing smart casual. You need to look professional but not like you are part of the wedding guest list. For example, a nice pair of comfortable pants and a collared shirt (men and women). If weddings are something you plan on creating a living from, I recommend you purchase a couple of shirts with your business name on them and wear them instead. A lot of wedding photographers wear black. It’s kind of a trade uniform. In my wedding photography experience, guests warm to you much faster when it’s clear you are the wedding photographer. They will see the camera and naturally pose. It can’t get any easier than that!